A foundational phrase throughout these many years of penning The Gold Update is “Being Short Gold is a bad idea.” ‘Cept that since 06 September 2011 when the price of Gold peaked at 1923, Short has materially been the side to court, or as the French would say “la position forte”. ‘Course where the Gold Shorts get killed is upon price opening an ensuing trading session significantly higher than where it closed prior, leaping over many-a-Short’s “stop” and sufficiently so as to force a margin call, even account forfeiture, and in the extreme, an eternal trading ban. So why are we going on about this? With another week in the books and thus another bonehead Barron’s piece, (this time in reference to the week prior that stocks had gained “Because Up Is the New Down”), as cockamamie as ’tis, spin that 180º and we’ve a valid description of late for Gold. 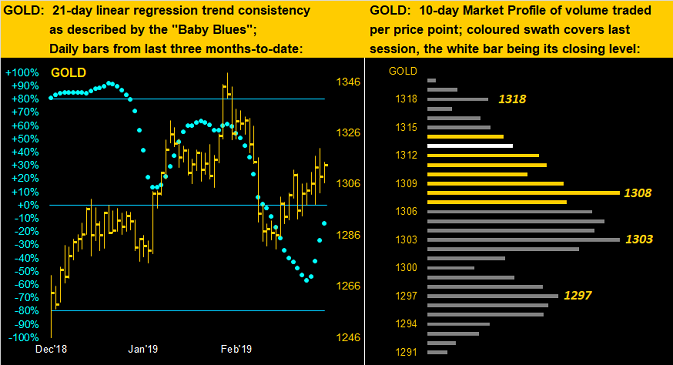 To wit, let’s begin with the chart of Gold’s weekly bars. The four rightmost red dots represent the weekly parabolic trend as Short per its so flipping on the week ending 01 March, (which in nearly two years was Gold’s worst one, -2.7%, since the -3.2% rout for the week ending 05 May 2017). Yet since then for these three most recent weeks, Gold in each case has consecutively recorded higher lows, higher highs and higher settles. Why? 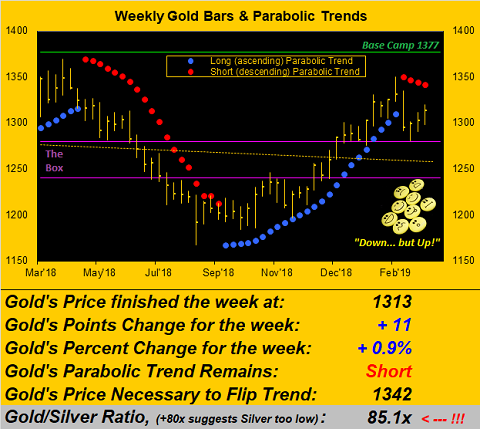 “Because Down Is the New Up”, or more specifically put, Gold is being bargain-bought within the stance of what is looking to this point as a short-lived Short trend. Naturally, the ongoing bidding for Gold remains fundamentally supported per the realization first by the Economic Barometer, second by the private sector and now lastly (as usual) by the members of the Federal Open Market Committee: that which was once considered robust is now rather bust, so to speak. Or to put specifically, economic growth is waning. We saw the positive effects of the Corporate Tax Cut blast through 2018’s first three quarters of earnings, the fourth then bringing them back a bit into more “typical” form. In fact specific to the S&P 500, for its 463 constituents reporting during the defined Q4 Earnings Season, only 71% were better year-over-year: that may appear impressive, but ’twas the weakest year-over-year improvement since Q3 of 2017. Was that on the news? No. Ah Squire, nice of you to check in. It ought be obvious with specific reference to the S&P’s high (understatement) “live” price earnings ratio of 30.8x along with the still-declining amount of dough it takes to make the S&P go, from $911k as of 29 January for moving the Index one point to now just $572k. ‘Course, neither too was any of that on the news, (nor shall it be even after ’tis too late to have abandoned the stock market). Got Gold? In closing, we continue noting the childish proliferation of stuck-on-stoopid headlines, and worse, their then leading us on the road to nowhere. 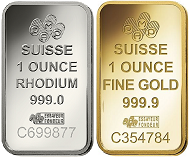 Just on Friday, fresh off the Dow Wires came “Forget Gold and Palladium, Rhodium Tops Both.” They’re just figuring this out now? Knowingly wasting our time by clicking upon the link came this result: “We’re unable to find the story you’re looking for. Please don’t sell us short.” Really? 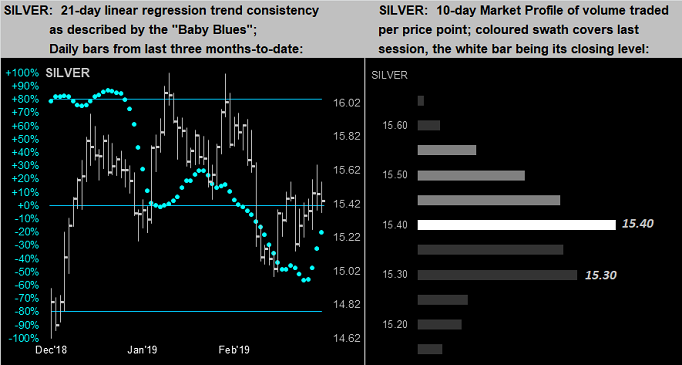 Sure you can run with some Rhodium, but do yourself a Long favour, luv: recognize that Gold’s Short trend is short-lived!